SYDNEY (AP) Australian playmaker Cooper Cronk has signed a two-year deal to join the Sydney Roosters in the National Rugby League, ending months of speculation about where he’d play after ending his long career with the Melbourne Storm. The 33-year-old Cronk has played 323 games for the Storm since making his NRL debut in 2004, ending his long tenure there with a premiership this month. The veteran Kangaroos and Queensland State-Of-Origin halfback announced during the 2017 season that he was relocating to Sydney for personal reasons. He said he was treating the move to the Roosters, one of the oldest clubs in the league, as a new opportunity. ”It marks the start of a new chapter for me both professionally and personally and I look forward to joining my new teammates and coaches, and immersing myself in the club’s culture in lead-up to the 2018 season,” he said. 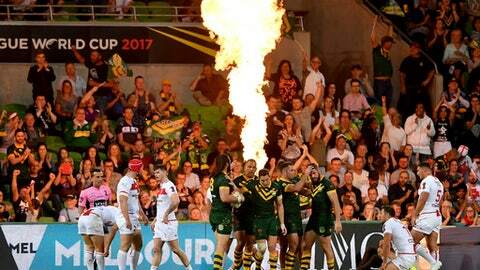 Cronk was a key player in Australia’s win over England in the opening game of the Rugby League World Cup last Friday. He will join the Roosters after the World Cup.